What makes it work is that most people are very much tired of the Bud Light ads, and a bunch of other people are excited about the return of Game of Thrones, so what looks like another ho-hum Bud Light ad ending up being a Game of Thrones ad in disguise was a rare fun twist. 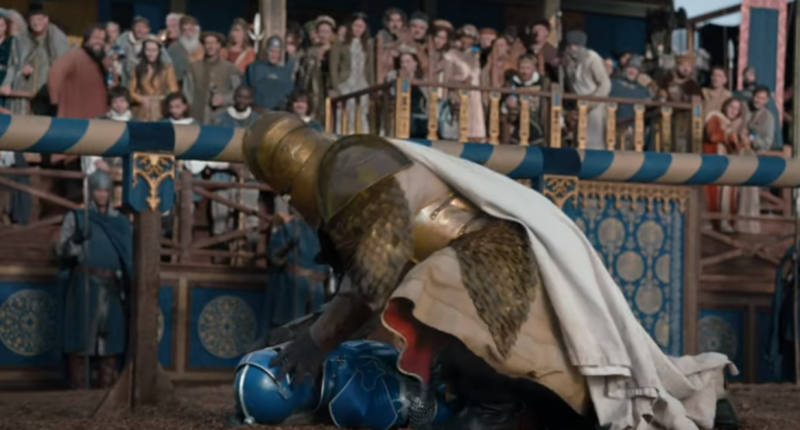 The brewer allowed a 60-second Bud Light spot to double as a “Game of Thrones” promo and reluctantly consented to sacrifice the Bud Knight, one of its most visible fictional pitchmen, who died violently in the ad. The production was an epic undertaking, with input from two of the nation’s top creative agencies and a “Thrones” director. Several ideas were scrapped to avoid stirring speculation over the show’s plot, or making the knight’s death too graphic. The ad that aired Sunday is the centerpiece of an estimated $20 million marketing blitz for the final season of “Thrones,” according to a person familiar with HBO’s marketing plans. The season premieres on April 14. When HBO made its approach in August, Bud Light executives and its ad firm Wieden + Kennedy learned this wasn’t going to be an ordinary ad: The script called for the Bud Knight to get his head crushed while fighting the Mountain, a fearsome warrior, in a joust—a nod to the way the Mountain killed Oberyn Martell in season 4. Bud initially agreed. But uneasy with the violence, the company wobbled as filming began—even suggesting alternative ideas such as having the Knight get beaten up, but live. Bud insisted that the violence and even the sound of the skull crush be dialed back. HBO considered several potential partners, including car makers and Coca-Cola Co. The beverage giant was never approached, but HBO had envisioned pitching a script that involved having Coke’s iconic polar bear turn into a “white walker,” a zombielike creature from the show. That would have been genuinely disturbing, because way more people like the Coke polar bears than liked the Bud Knight. It ended up being more entertaining than a trailer would have been, and while it is slightly disappointing to have a show so eagerly throw characters into the world of advertising, it’s hard to argue with how this one ended up.